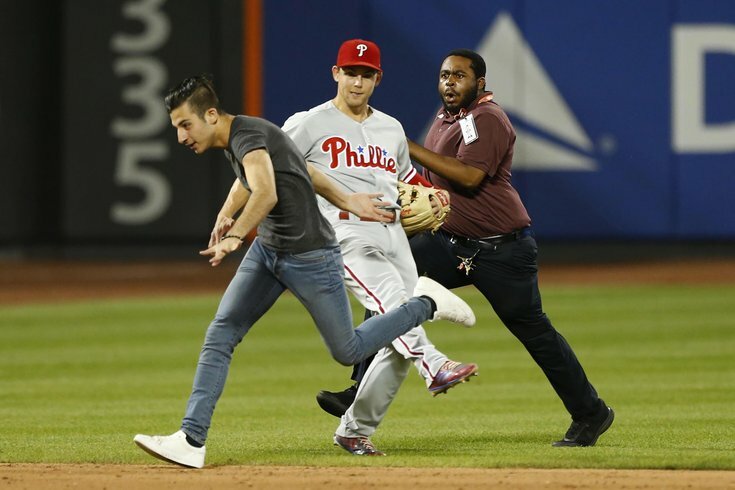 Philadelphia Phillies shortstop Scott Kingery (4) tries to trip fan that ran onto the field during the nine inning against New York Mets at Citi Field. After watching the entirety of Wednesday night's Phillies game against the Mets at Citi Field, I could feel my eyes starting to get heavy as the game headed into the bottom of the ninth inning with the score tied at nothing apiece. That's when Tom McCarthy almost begrudgingly noted that a fan had run onto the field. Oh boy! Aside from Vince Velasquez's brilliant performance coming off the DL against Mets ace Jacob deGrom, this was the most exciting thing that had happened all night. Well, the cameras did not show the fan (more on that in a bit), but New York Daily News reporter Daniel Popper was at the game and recorded the chase that ensued. The Phillies went on to lose the game via a walk-off home run from Brandon Nimmo in the bottom of the 10th. Boo. Anyway, back to the important question: Why didn't NBC Sports Philadelphia show the fan? Aside from the pitching performances — and an unusual double play — that had to be the most entertaining moment of the game. NBC Sports didn't immediately return a request for comment Thursday morning. We'll update this if they do. But I can imagine their response. A 2016 Slate article noted that most American television networks have a policy of not showing morons who decide to join the field of play, mainly so it doesn't encourage similar behavior. I mean, I get it. Especially with local networks that have stronger relationships with the teams they broadcast on a regular basis. 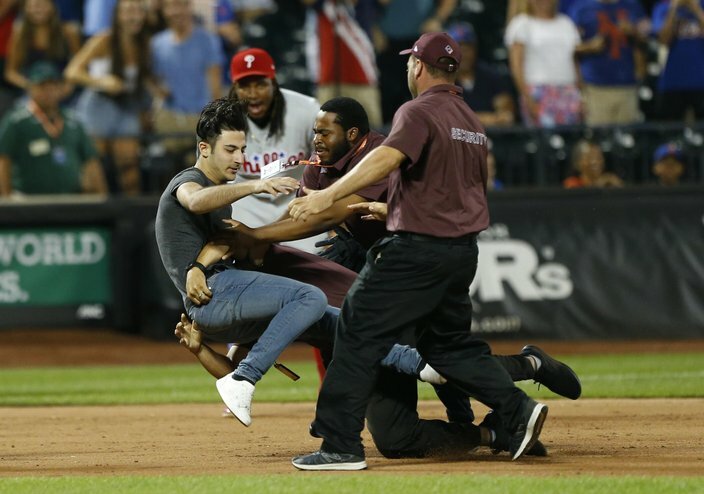 This was at Citi Field, but if you're the Phillies, would you want to give every drunk doofus who sends security guards on a wild chase around the diamond that kind of platform? Of course not. 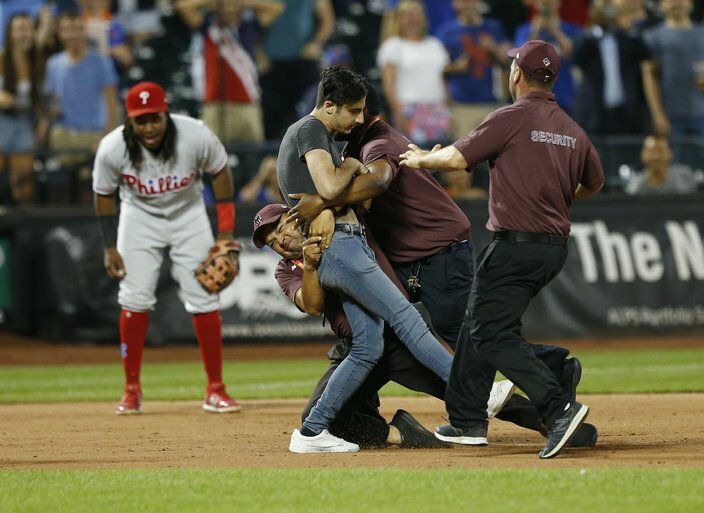 New York Mets security tackles a fan that ran onto the field in the ninth inning during game against Philadelphia Phillies at Citi Field. 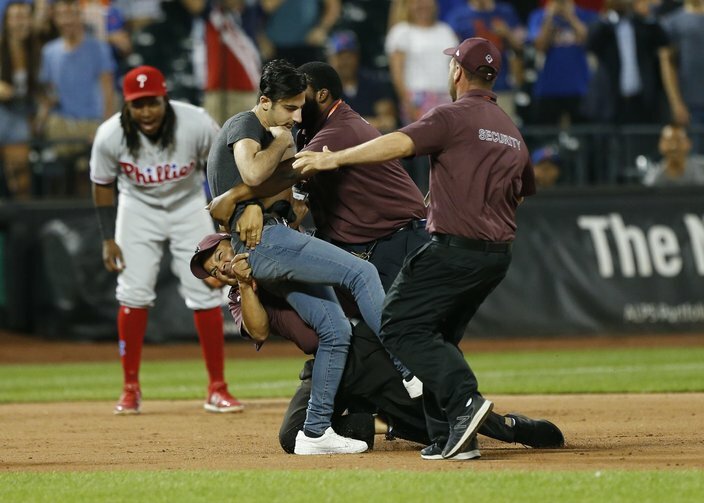 New York Mets security tackles a fan that ran onto the field in the ninth inning during game against the Philadelphia Phillies at Citi Field.